I spent a good part of Thursday, the first formal day of showings for Mercedes Benz Fashion Week, fall 2013, at Lincoln Center, where I attended showings by BCBG Max Azria (it's all about an urban gypsy, with an emphasis on layers, more volume, and great fur vests), Richard Chai Love (there was a precise military feel, with lots of fatigue green, and some great parka coats and jackets), Timo Weiland (stellar and rugged outerwear, some with oversized shearling collars), and Tadashi Shoji (inspired by St. Petersburg, Russia, it's all about paisley, cut velvets, and especially, lace). We all know that runway fashion is only a part of the equation- it's how it all ultimately translates to real life, and to the streets, that completes the cycle. In the end, regardless of how great a collection is, it's only a bunch of clothes when all is said and done. It's up to the wearer to make it her own and give it life. It's interesting to see what the customer picks and how he or she wears it, and it's easy to understand why street fashion has become so important; hence, all the street photographers and bloggers who are there to record it all- "the good, the bad, and the ugly". And boy-oh-boy.talk about the bad and ugly. I know there are exceptions to every rule, and yesterday was just the first day, but my overall impression was that from the look of things, not only ISN'T there a direct correlation between having great personal style, and being in the fashion business, but quite the opposite: it can be a real a detriment. Too many try too hard, are too focused on dizzying trends du jour, trying to look too young (when they're not), and they miss the boat completely. The main Tent has had an obvious face lift, or should I say, a makeover: things are laid out a bit differently, it's a little more welcoming and comfortable, there's a bit more seating, and there's the addition of a much needed coffee bar. But while this prestigious location is undeniably the cultural epicenter of Manhattan, for me, it still feels more like the reception area for a big trade show, but with better dressed guests. Though, on second thought, maybe not, as the crowd was rather motley looking, with more than a few laughable eyesores. I know there are exceptions to every rule, and yesterday was just the first day, but my overall impression was that from the look of things, not only ISN'T there a direct correlation between having great personal style, and being in the fashion business, but quite the opposite. It can be a real a detriment. Too many try too hard, are too focused on dizzying trends du jour, and they miss the boat completely. I was making my mental observations and taking it all in (short sequined dresses more appropriate for evening than daytime, worn with horrible shoes no less; ill fitting clothing; unflattering proportions; see through skirts and raggedy furs; etc.) while leafing through my free reads, which are thankfully handed out all day. I had a stack that included WWD and The Daily Front Row, but was immediately taken by the stark cover of T: The New York Times Style Magazine. The brand new issue and complete redesign, under the tutelage of Deborah Needleman, makes its debut on February 17th and yesterday, in celebration, there was a launch party held at the Grand Central Oyster Bar, hosted by Times chairman Arthur Sulzberger Jr. 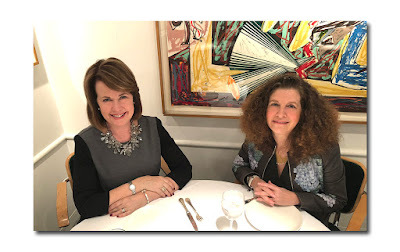 I have long been a fan of Deborah Needleman's and have thoroughly enjoyed what she did during her tenure at The Wall Street Journal. 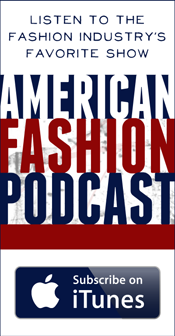 Her take on fashion is smart, relevant, and completely modern, and I always learned something new. She told WWD that while the Times represents a "broader magazine" with a "culturally sophisticated and more tolerant audience", she knew exactly what she wanted to do at the Journal, "which was to bring fashion to a non fashion audience and to make fashion interesting and desirable to that audience." Well, guess what? She managed to make it interesting to me as well, and I am not part of that non fashion audience. 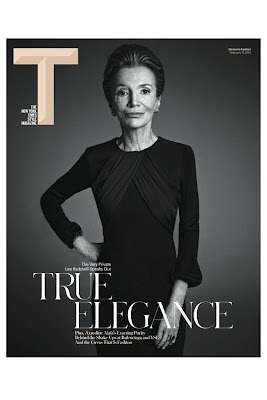 True to form, instead of a young, happening, hip, of the moment celebrity or model for the cover, Ms. Needleman wisely chose 79 year old Lee Radziwill, photographed by Mario Sorrenti, (there's a corresponding feature on Ms. Radziwill inside with images also taken by the famed photographer), who was dressed simply in black, with the words, "True Elegance" in big letters on the bottom. In describing her choice, she said, "I think we’re sort of post-everything. We’re post-race, post-feminist, but I feel like we’re not quite post-age. And we should be" . "Everything is so chaotic and noisy and bloggy, and she represents a kind of elegance." Yes indeed, it's hard not to notice how chaotic, noisy, and bloggy fashion (particularly during fashion weeks) have become. And conversely, how unfashioney, ungimmicky, and elegant Ms. Radziwill looked, which is in direct opposition to many of the show attendees, who seem to not have a clue as to what is flattering, chic, or appropriate (to the situation, the weather, their bodies, their ages, etc.) Lee and her sister, the late Jacqueline Kennedy Onassis, have always understood the importance of the word 'appropriate' as it applies to themselves and to fashion, and they have long embodied the idea of great personal style (past, present, and future). Whenever I see pictures of Lee out and about these days (whether in New York or Paris), I am always struck by how perfect she looks. She is unapologetically chic, stylish, and utterly fashionable, but is never a fashion victim. She wears the clothes and they don't wear her. If she's 'on' trend, it's only because the trend completely suits her, and is in sync with her own personal style. She always chooses wisely, she completely gets it, and always nails it. One could do a lot worse than to follow her lead, which is something to think about as we start yet another fashion cycle. The press preview for "shoe obsession" was held at the Museum of FIT at West 27th street. I must confess while I enjoy looking at beautiful shoes I was only slightly interested in attending this exhibition because I view shoes as ancillary to the main event, clothing. However, I was pleasantly surprised at the creativity and extravagance of this exhibition along with the meticulous attention involved in the execution of these accessories. The exhibit featured over 150 examples of contemporary footwear and the display of shoes was an exciting feast for the eyes. Shoe construction and design is no trivial matter and some highly artistic designers were available to explain the essence of their footwears design and construction. Marieka Ratsma recounted her love for shoes as her great grandfather was a shoemaker. Ratsma's shoes are modeled on nature and the specific shoe exhibited was a mimicry of the skull of a bird. The complexity of her shoe's design required her collaboration with an architect who made the technical drawing of the shoe. 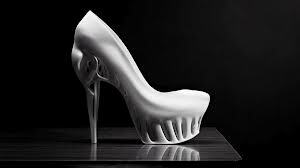 The shoe's heel was comprised of porcelain in the the heel enabling the shoe to be both strong and lightweight. A similar complex artistic shoe designer is Masaya Kushino, 30, who has been working in shoe design for six years. The Japan based designer uses antiques, nature and art as his inspiration and frequently spends months designing his couture shoes with the help of Japanese artisans. The displayed shoe, referred to as the wind horse, was triggered by his love of a horse themed opera he viewed in Japan. The heel of this shoe is made from human hair and traditional wood and the entirety of the shoe took four months to complete. His next shoe, a black shoe inspired by the fictional Japanese animal called Kimara, is a lush combination of various components. Kushino utilizes actual stingray, sheep and deer in the construction of the shoe with a heel based on a lions foot. The totality of the effect is a complete animal. His artistry is manifested in all aspects of his design and his shoes sell in a Japanese furniture store reflective of their intrinsic artistic value in Japanese culture. Upon leaving I noticed a suave Italian gentleman named Gianluca Tamburini, designer of the shoe company conspiracy, who said, "shoes are the most important accessory for a woman." His shoes are constructed from aluminum and alloy so that the customer can modify and customize the laces and heels of the shoes according to their desires. This malleable material allows him to accommodate his clients by changing the jewels or design of the shoes within five minutes of the request. The utilization of technology and progressive material in shoe construction has revolutionized the shoe industry. The other shoes on display were visually breathtaking. 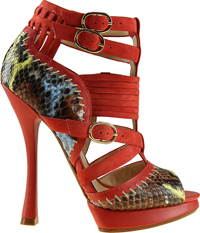 The shoes came in a variety of shocking colors many adorned with sequins and mega heels. 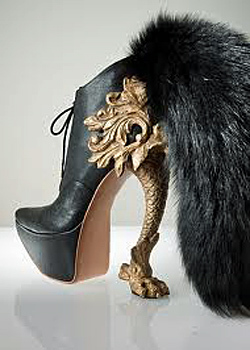 The practicality of shoes has been discarded by our society with the advent of the Lady Gaga-McQueen era. This exhibit is a paradigm of the axiom, "beauty at all costs" and will entertain and delight all the Carrie Bradshaws in our society. While I do not share the shoe fetishes and obsessiveness of some fashionistas this exhibit has piqued my dormant interest in shoes and I am slowly clearing a clothing closet to make room for another pivotal accessory, the new holy grail in fashion - the shoe. Get all the support of an underwire bra without underwire discomfort. This bra bends and twists with your figure, thanks to a flexible "unwire." It won’t lose its shape even after repeated machine washings. 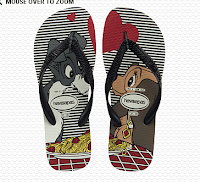 Your favorite canine couple is immortalized in an adorable pair of limited edition flip-flops. 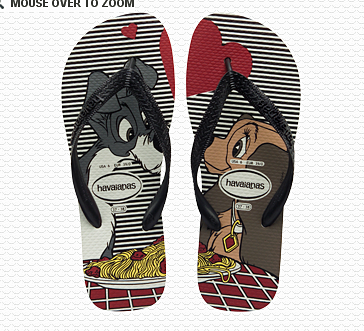 These Lady and the Tramp Havaianas come in a red envelope and are perfect for Valentine’s Day gifting.